We have reviewed at a LOT of iPad cases since we got the tablet last April. It is amazing how big and how quickly the aftermarket for iPad cases came to life. After nine months, new cases are still coming onto the market. The two new ones we will be taking a closer look at today are different than what we have looked at to date. The Dayton leather pouch from Fossil for the iPad is just that…a pouch. It is nicely lined and protects the tablet with the least amount of fuss. Just slip it in, zip it up, and go. If one just needs a pouch, you may ask, why not go with a neoprene or silicone one? Because they have no character, our answer would be. Unlike a leather pouch, they won’t get better looking with use, age gracefully, or acquire a personality. When they get a scratch or a nick, there won’t a story behind it. This is not to say that the Fossil pouch will either, but if you invent one, people are more apt to believe it 🙂 So, if you want to pair your high-tech gear with a high-touch pouch, this Fossil is the one to get. 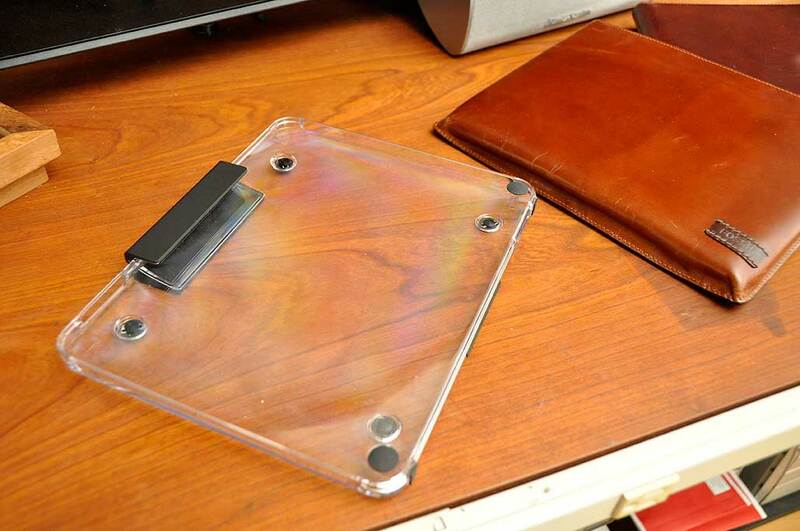 When we first saw the Lapworks Crystal Folio, it took us of back to the days of G3 when Apple used a lot of polycarbonate in the design of their computers and displays. We happen to like that style, which was why we wanted a closer look at this case. Like the Apple products of that era, the Crystal Folio is cleanly designed, well constructed, and is a “clear” departure from others on the market. The hinge is bonded to the cover, so no screws were used. No screws mean less likelihood of stress fractures in the plastic. There are four large rubber feet for cushion and stability. 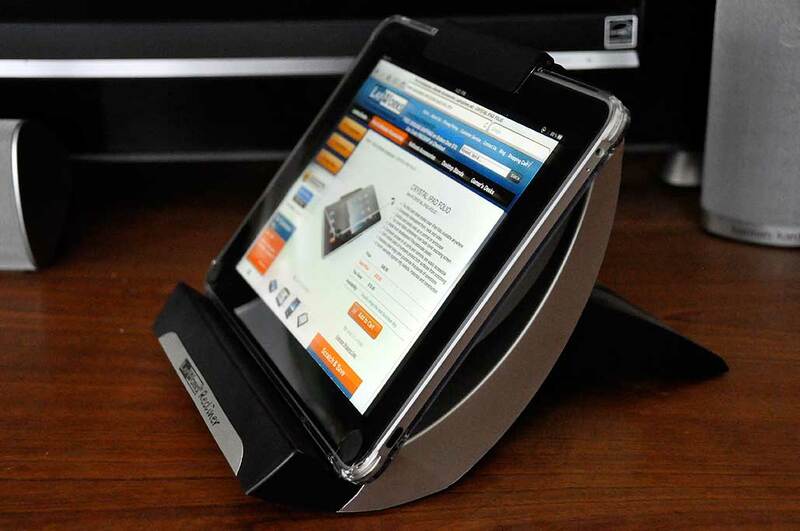 A rubberized coating on the hinge makes the folio easy to hold. The overall fit of the case is superb. We like how the iPad looked in the Crystal folio. The cutouts make it easy to access all of the side buttons and ports. At first we had a few issues with the usability of the case. Just by looking at the lid of the case, we assumed that it would not fold back, nor would it lay flat. 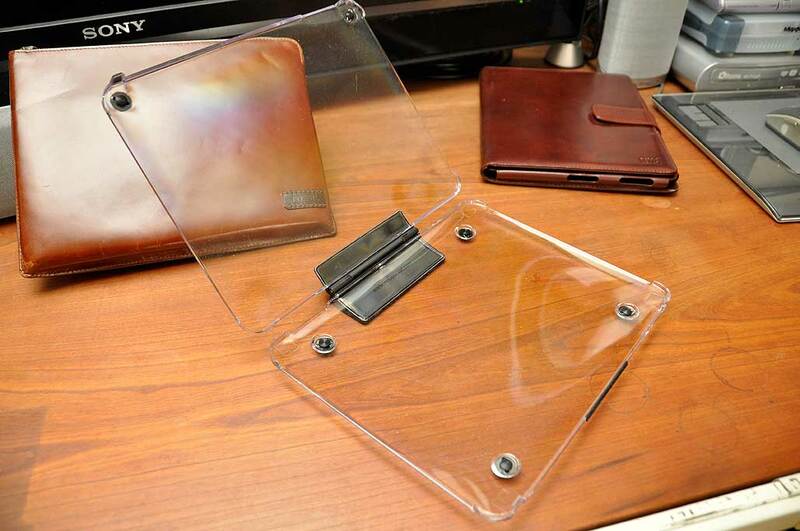 In reality, the hinge is designed to rotate the cover so it can be folded underneath the case. Brilliant!!! The more we play with this case, the more we realize how awesome it is. A case like this is perfect for situations when you want the iPad protected, not touchable, but still have the screen visible. Times like when your six-year old wants to watch a movie on your iPad or an automatic demo is running at your booth at a trade show. No other case on the market can protect the iPad in this way. Because of it clean look and unique capabilities, we think this case is among one of the best out there.